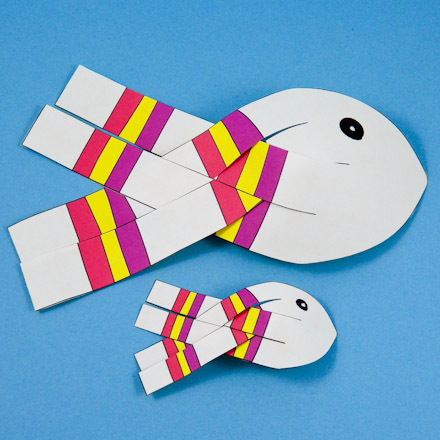 In this project, make two sizes of paper fish. 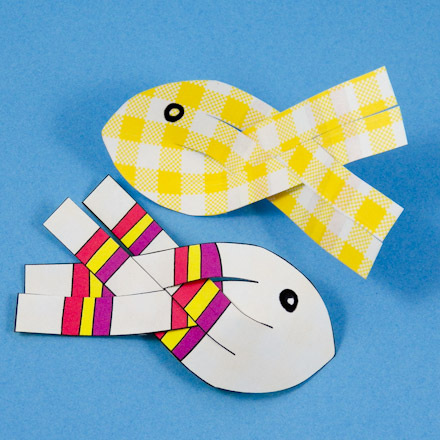 Weave the tails together in two easy steps to create three-dimensional fish. The fish can be hung from the ceiling or in a window, and with the slightest breeze will dance about to the delight of all. They can also be made into a mobile or used as gift wrap decorations. Can't you see them in a baby's room? Related crafts: See how easy it is to make a mobile in the Halloween Mobile craft project. Choose which fish you want to make. Download and print the pattern. Print black and white (B&W) patterns on white paper and then color them in, or simply print on colored paper. 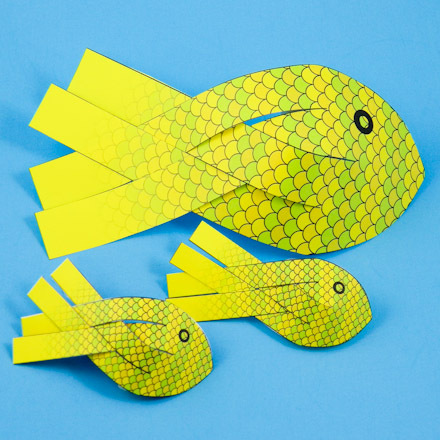 The double-sided patterns are for making double-thickness paper fish with printed designs on both sides. Cut out one or all of the fish on the black outlines. For the double-sided patterns, cut out the rectangles surrounding each pair of fishes on the gray outline. Fold the paper in half along the middle gray line, carefully matching corners. Glue the two halves together. After the glue is dry, cut out the fish on the black outline. 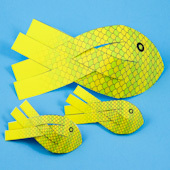 Tip: The Double-Sided Paper Fish pattern makes a heavier fish with different designs on the front and the back. 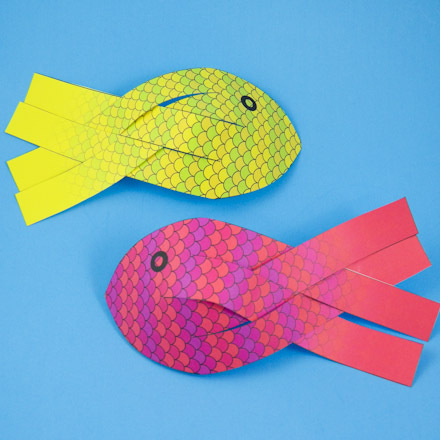 The Paper Fish with Scales may also be made double-sided. If you like, decorate your paper fish with colored pencils, crayons or markers on the front and back. Color the fish with colored stripes going sideways across the body. Or, try swirls or curlicues going across in various colors. The head can also be colored either a solid color or with more stripes. 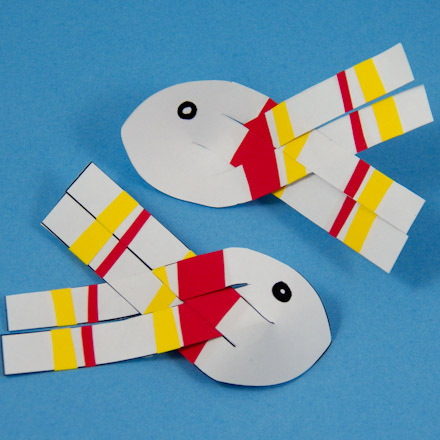 Tip: You can also cut strips of colored paper to glue on both sides of the fish. Cut the fish tail into four strips by cutting into the body lengthwise on the three solid lines. Lay the fish with the strips pointing downward. Take strip number 3 (from the left) and bring it over strip number 2 and under strip number 1. The body will poke outward just at the top of the strips. Next, take strip number 4 and bring it under strip number 2 and up over strip number 1. Shift the strips slightly as necessary to make them lie neatly beside one another. Using a toothpick, put a dab of glue in between strips 2 and 3, and in between strips 1 and 4. Press together and make sure all the strips are still lined up nicely. Your fish is now complete. Display your fish on a shelf or create a mobile with multiple fish. For a cute package topper, trace the fish pattern onto wrapping paper and complete without coloring. 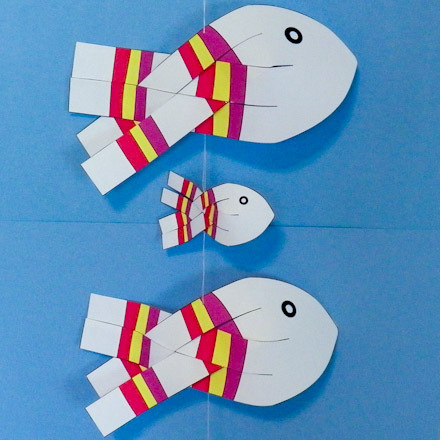 Join the fish together with thread and hang them in a window or from the ceiling. The fish will move with the slightest breeze to the delight of babies and small children, and will make any room cheerier. To join the fish, thread a needle with a doubled strand of thread at least three to four feet long. Knot the end of the thread. Push the needle from back to front near the top and center of the fish. Pull the thread through and secure the knotted thread with a small piece of tape or a dab of glue on the reverse side. Repeat for each fish, leaving 2" or more between each pair of fish and securing the thread with tape or glue on the back. That's it! Your fish are done! Thanks to Janet LaFara for creating this craft project for Aunt Annie's Craft Page in 1997. 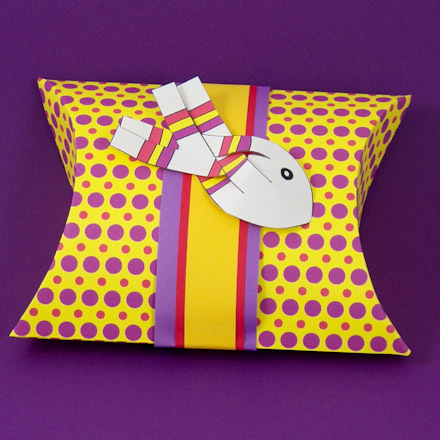 Tip: The Wild Violet and Red Dots, Wild Violet and Red Dots on Yellow and Wild Violet and Red Dots with Yellow Stripe ePapers coordinate with the 3D Paper Fish in this project. 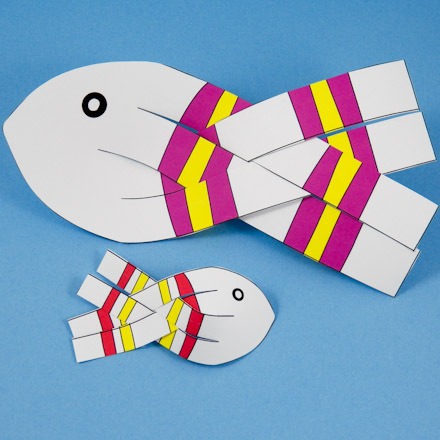 Tip: Use the 3D Paper Fish to decorate gift boxes. 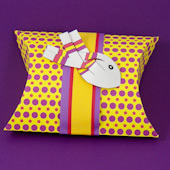 This Pillow Box was made with Aunt Annie's Wild Violet and Red Dots on Yellow ePaper. Paper ribbon was made from strips of paper in coordinating colors. Tip: To add a colorful back to your 3D Paper Fish, print one of Aunt Annie's Gingham Digital Papers on the reverse side of the pattern. Tip: Decorate the plain fish patterns with strips of colored paper. Tip: The Paper Fish with Scales coordinate with the Animal Scales ePapers.